I like to cook, most of the time I would say I love to cook. Cooking is always a lot more fun when I'm making a meal for my family that makes EVERY one happy or cooking for a dinner party, event or friends. I love to cook with the ipod on and music blaring, while I sing right along and sometimes dance around the stove. I don't suggest anyone picture that image. 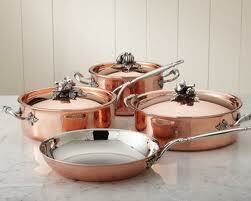 I have been given a set of Ruffoni (made in Italy), in my choice of copper or stainless. These have to be THE prettiest pots and pans...vessels. 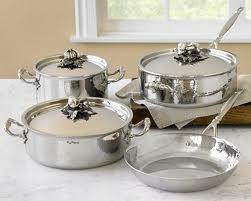 I look at these pots and want to have a dinner party and cook till I have a sore throat from all the singing. Again don't picture that image. On top of being incredibly beautiful they have a reputation for conducting heat evenly and consistently, they never interrupt the flavors or nutrients of the food, and they are so gorgeous that food does not stick to the bottom. Neither the copper or the stainless can go in the dishwasher, but my what can? I have La Crueset in a variety of fun colors but they are heavy and not has dreamy looking as the Ruffoni. I know everyone is constantly SWOONING over something, well SWOON away at the Ruffoni. Take a look at both sets, they are equally as beautiful and owning either set has always been a dream. To have this opportunity is incredible, I could not be more excited...RUFFONI. Take a minute and leave your vote Copper or Stainless??? One quick side note, I love, love, love all the emails and promise I work everyday on answering all of you. I will get to each one and you will hear from me, my email inbox is a delight to open each day. if I could have a set it would be the COPPER!!!!!!!!!!! It's just soooooooooo PRETTY!!! The copper is beautiful, but I vote for stainless. I am on board with you girls...copper. COPPER, hands down. I too love to cook and I have copper along with good ole cast iron and Le Crueset. I don't even mind when my copper becomes "loved looking". For me, it just adds to the beauty and character. :). P.S. I have two fabulous giveaways going on, both ending at midnight! Make sure you stop by and check them out! COPPER.......They are special and so beautiful! Copper reminds me of Martha Stewart (in a good way!). I've been dying to get a set of All-Clad stainless. You can't go wrong either way.